This year our (homeschool) family went to Mammoth Cave. There we, of course, learned about the ‘blind fish that have evolved over billions of years’. We, and our children, know enough not to believe what evolutionists tell us, but we do listen to their reasoning to try to figure out why evolutionists might come to these conclusions. 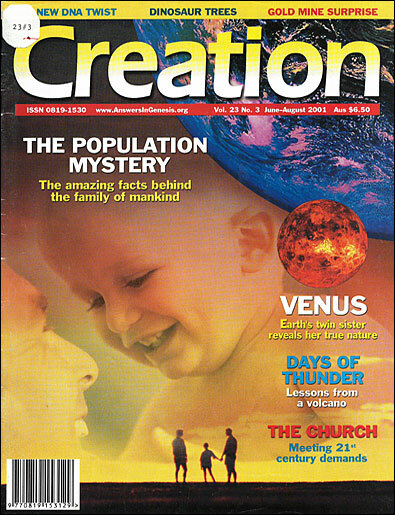 When we returned home from this trip, Creation 22(4) was waiting for us in our stack of mail. What a thrill it was to see the article on blind cave fish right there on page 51! Thank you for helping us teach our children the truth. Every issue of Creation is a treasure of interesting and worthwhile information. Even the comment ‘Gift gripe’ in the (22(3)) Feedback, from Martin Norris, was interesting. In making such adverse comments about Creation magazine, he was really telling more about himself. Attacking AiG as being ‘delusional’ and using ‘sick, irrational, illogical denial material’, really showed, I believe, his own state of mind in which he was unable to deal with the truth. If he would give proper thought and investigation to the claims in Creation, he would find that it is true. It is my prayer that this ‘offensive’ gift subscription he received will be the beginning of bringing him to the real truth of his need for salvation and a new life of honouring God. Re the article on the back of 23(1), about reports of a live dinosaur in New Guinea. Last June, on a missions trip to Irian Jaya, Indonesia (on the other half of the island of New Guinea), I heard this story from a missionary: In one remote village, the locals told stories of a large beast to the missionaries. One of the missionaries took a book of dinosaurs and the locals pointed out in the book the creature they had seen. Keep up the good work. I love your magazine. We’re all enjoying the tapes very much. Thank you for your ministry. Praise the Lord for Creation magazine. The knowledge you share has transformed my understanding of Biblical creation. My first magazine was in 1989, and I am still excited and renewed upon receiving and reading each issue. The magazine has been a stepping stone for my teaching creation to children ages nine through high school. Even one adult class gets involved in videos and articles. God inspires us in many ways, but He certainly has His hand upon those of you carrying out this special message of truthwe are richly blessed. I am so excited about your creation museum [in the greater Cincinnati region of the USA] and your ministry! My family and I cannot wait to visit the museum when it opens! I even had a small creation museum in the loft of our barn. In a recent TV program the renowned evolutionary presenter, David Attenborough, described the destruction of forests and our environment by humans, the isolation of some species with the consequent loss of gene information and a number of other issues. Evolution is often described as being powerful enough to bring into being the marvellous wealth and variety of living species already found in nature. So, shouldn’t we expect it to replace what is currently being lost with a wide range of new varieties? I fully agree with Attenborough that we should care for what we have, but if his ‘scientific observations’ on evolution and the emergence of new species are correct, he should have nothing to fear about future populations of new plants and animals. Is his concern a tacit admission that evolution does not in fact work? The article by Catchpoole and Wieland (23(2):13–15) provides many fascinating examples of animals which have changed in response to their environment in very short periods of time. Other examples of this phenomenon, as well as examples of the formation of new species in as short a period as one generation, can be found in my book: Noah’s Ark: A Feasibility Study, pp. 180–182. Further, the fact that rapid speciation does not equal evolution can also be seen from a quote featured in my book (p. 7) from Bullock, an evolutionist. He almost sounds like a creationist when he says that the origins of species and genera are examples of lateral radiations, and are thus quite different from the (supposed) origin of families, orders, classes, etc.